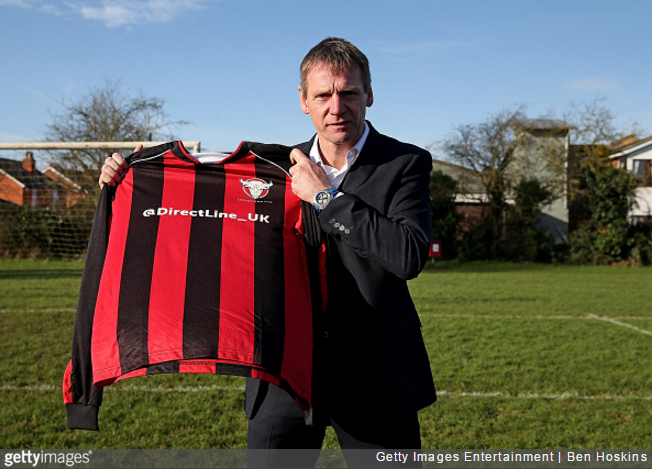 It should be stated right up top that this is a massive publicity stunt for an insurance company (see if you can guess which one), but Stuart Pearce has come creaking out of retirement to sign for non-league Longford AFC, aka, the worst team in English football. Longford have lost all 18 of their games so far this season in the Gloucestershire Northern Senior League Division Two, conceding 179 goals (an average of almost 10 goals per game) and scoring just once. As such, manager Nick Dawe sought to bring in a bit of experienced defensive cover and just so happened to convince Pearce, 53, to sign on and muck in. A year ago we were playing in front of one man and his dog and now we are set to get hundreds for Stuart’s debut. Stuart knows that there will be no special treatment, he will still need to pay his £5 a game subs. I believe grassroots football is essential to the lifeblood of the game so I jumped at the chance. I started out in non-league football playing for Wealdstone before joining Coventry City so I’m looking forward to working with manager Nick Dawe, and helping a group of talented young footballers achieve their dreams and, hopefully […] seeing how far they can go up the league. Whatever you say Psycho. We can only assume there’s a tax bill needs paying. It’s Direct Line, in case you were still wondering.